Need a eye-catching centerpiece for your next party? 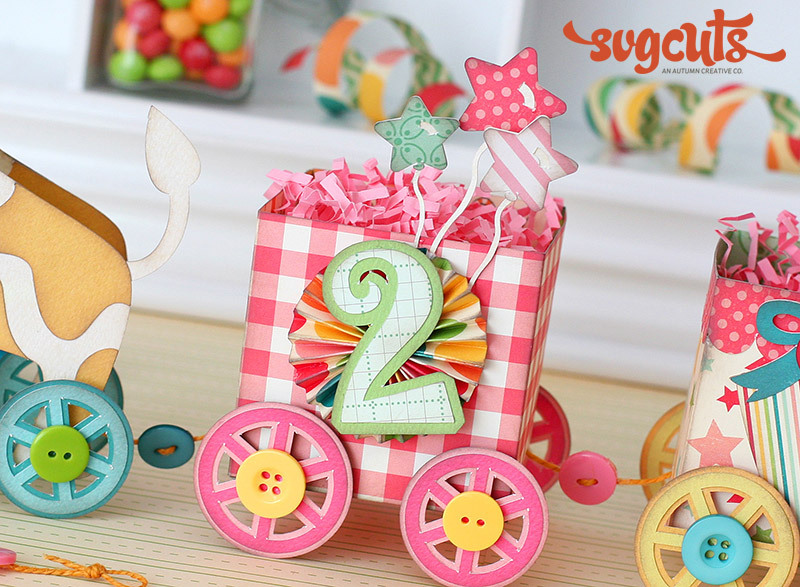 What about a cute way to give some sweet treats? This ’vintage’ toy train is perfect for that! Hop on and I will give you all the details on creating one for yourself! Size all shapes to width indicated using "keep proportions" or "aspect lock". Doing so will automatically size the height. Cut two Charlotte’s Favor Box bottoms at 11.50” w. These will be the ’cars’ of the train. Cut two giraffes at 5.013”w. Cut a set of wheels in light blue. For the two wheels going on the giraffe FACING YOU, adhere with foam adhesive to add dimension. Embellish with green buttons. For the BACK wheels adhere them on the ’inside’ of the section giraffe. You’ll want to make sure you have them lined up evenly so everything sits nice and straight. Tip: When adhering the wheels put the larger wheels in the front, and smaller in the back. Using your two dowel rods (trimmed to 1.50” long) adhere inside on the giraffe’s hooves/wheels with hot glue. Adhere the two giraffe’s ears together to ’close’ the top of the giraffe. 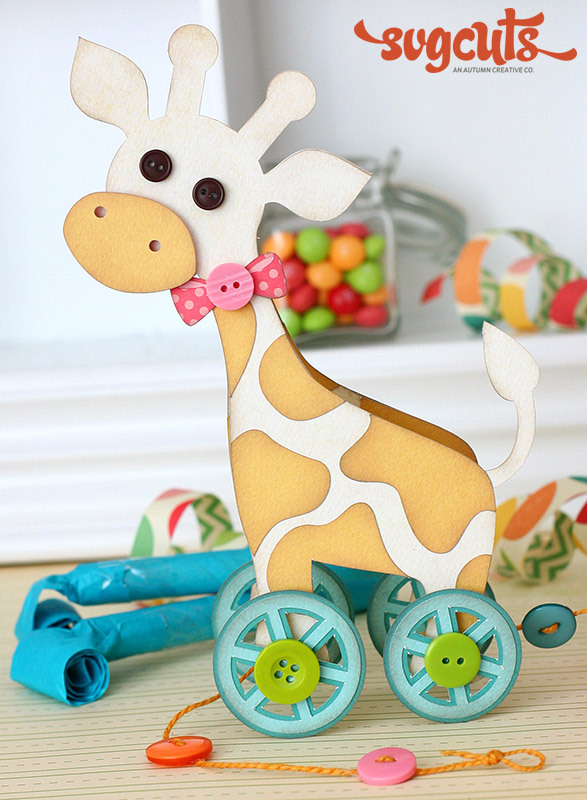 Embellish the giraffe with a bow, button, and button eyes. Set aside. Car #1: Assemble the favor box. Cut a set of wheels in red/pink. Adhere the front wheels (wheels facing out) with adhesive foam. The back wheels will be adhered right onto the car. Add yellow buttons to the center of each wheel. To create a rosette, cut two strips of polka dot paper to 1”x7.5”. You will score every 1/4” and accordion fold. Do this for each strip. You’ll then adhere the edges to create a rosette. Adhere the rosette to the center of the car. Cut three star shaped balloons; 1.079”w, .972”w, and .820”w. Adhere with hot glue behind the rosette. Using a font of your choice from your library, cute a #2 and a shadow layer about 2”h. Adhere to the rosette. The first car is now complete; set aside. 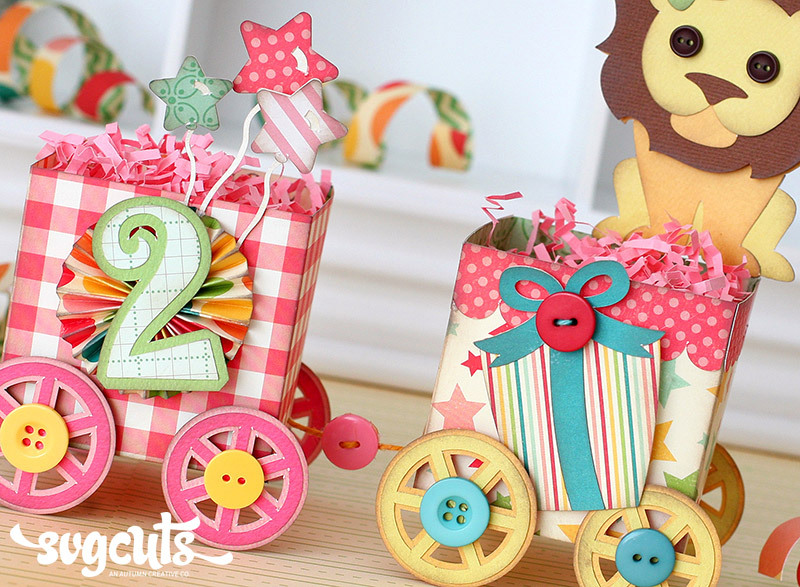 Car #2: Assemble the favor box. Cut a set of wheels in yellow. Adhere the front wheels (wheels facing out) with foam adhesive. Adhere the back wheels directly onto the car. Embellish with buttons. Cut two #9 ribbon strips at 7.054”w. adhere and trim to fit around the top of the car. Cut the present and adhere to the center of the car. Next you’ll cut the lion. Adhere the lion’s mane and head with adhesive foam for dimension. Add buttons for eyes. 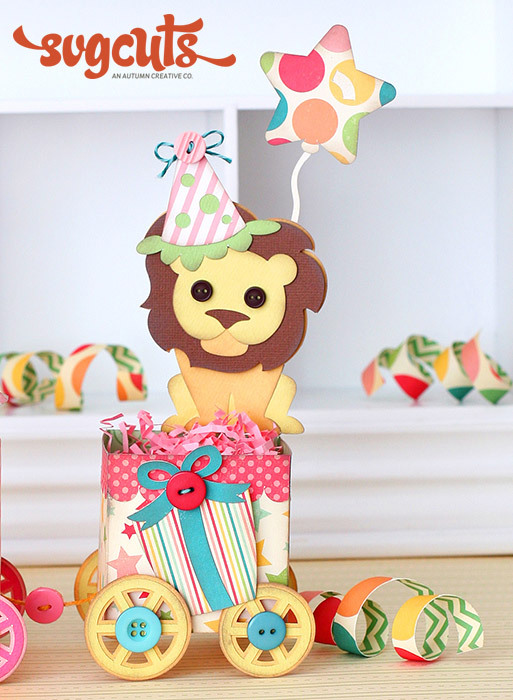 Cut and adhere the party hat to the lion. As you’ll see I trimmed off the bottom of hattop.svg because I wanted more of the green to show. Cut the ’pom-pom’ off the top and adhere a button and twine. Cut a large star balloon at 2.200”w and adhere behind the lion. Top adhere the lion to the corer of the car, you’ll just use top globs of hot glue. To attach everything together you’ll poke small holes in the cars and string a piece of jute cord through. In between each car and the giraffe, add a button. Tie the jute cord onto the dowel rods on the giraffe. Remember to leave a long ’pull string’ Add a few more buttons and a knot at the end. NOTE: This does NOT move. It’s simply a decor piece. Get inky! I added grey ink to pretty much everything! It gives a more ’vintage’ feel which is what I was going for! Paper choices are going to play a huge roll in the outcome of this project! 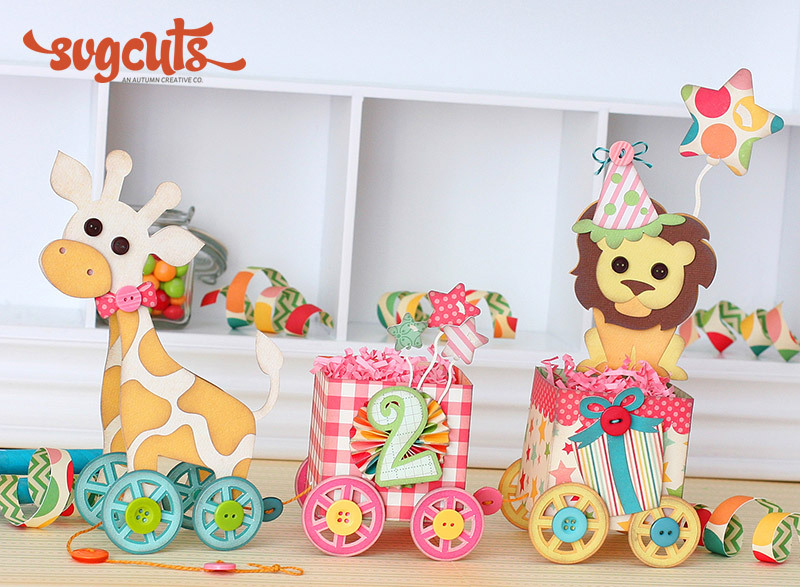 There’s just enough to look at without being busy, so have fun with cute patterns and colors! Too many patterns might not ’mesh’ too well together so choose wisely! A nice mix of solids and patterns will go a long way! When selecting buttons try to get some that coordinate really well! You want the buttons to flow with the look of the project, not stand out and yell, ”Hey, look at me!! I’m a button!!”. Many paper manufacturers also offer buttons and embellishments to coordinate with their collections so try and go that route. Most of all.. and like I always say, HAVE FUN WITH IT! This project looks great but not a lot of work. It really does go together easily! 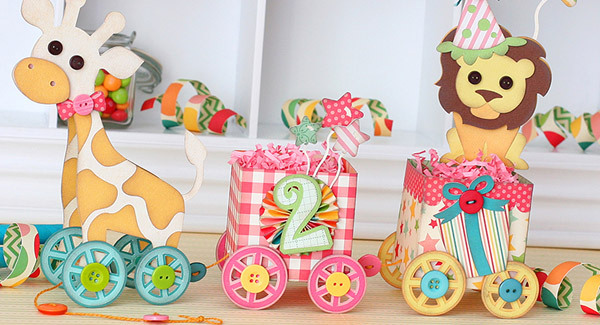 You can make several for birthdays, baby showers, gifts, etc. I truly hope you've enjoyed this project. I know I sure enjoyed creating it! Holy Cow!! This is fabulous!!! You are so creative. I’m in love! I really admire your work. What a FABULOUS project! 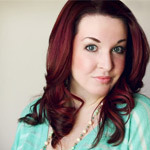 Really jaw-dropping…great inspiration!